I'm Erin, and I have a passion for math and science. I graduated from University of North Texas with my BS in Chemistry and a minor in Math. I plan to go on to graduate school and earn a PhD in Chemistry so that I can teach at the university level and conduct research. I tutor middle school, high school and college students in the following subjects: pre-algebra, algebra, , calculus, chemistry, organic chemistry, and physical chemistry. I am College Reading and Learning Association (CRLA) certified and have several years experience tutoring middle school, high school, and college students. I have worked at UNT's Learning Center for 3 years and I substitute teach for middle school and high school. My students often tell me that I am able to explain concepts in ways that make the material more clear. I am very patient and will spend time working on-one-on explaining the material in a way that is suited for the student. I enjoy sharing my love for math and science and even more I enjoy helping my students learn to love it also. I look forward to working with you, and I promise I will do my best to help you understand and enjoy math and science as much as I do. I have 4+ years of tutoring experience in math and chemistry, including Algebra 1. I have a Degree in chemistry with a minor in math and am currently working on a math degree. I am a CRLA certified tutor. I have 4+ years of tutoring experience in math and chemistry, including Algebra 2. I have a Degree in chemistry with a minor in math and am currently working on a math degree. I am a CRLA certified tutor. 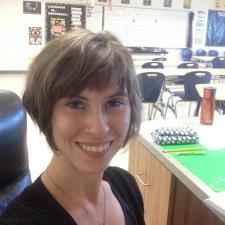 I have 4+ years of tutoring experience in math and chemistry, including Calculus 1 and 2. I have a Degree in chemistry with a minor in math and am currently working on a math degree. I am a CRLA certified tutor. I have 4+ years of tutoring experience in math and chemistry, including General Chemistry 1 and 2. I have a Degree in chemistry with a minor in math and am currently working on a math degree. I am a CRLA certified tutor. I have 4+ years of tutoring experience in math and chemistry, including Pre-Algebra. I have a Degree in chemistry with a minor in math and am currently working on a math degree. I am a CRLA certified tutor. I have 4+ years of tutoring experience in math and chemistry, including Organic Chemistry 1 and 2. I have a Degree in chemistry with a minor in math and am currently working on a math degree. I am a CRLA certified tutor. Taught me organic chemistry II. She brought her own textbook to help me out with my quiz. She made organic chem. mechanisms a breeze! Erin is helping my student with Algebra 2. My student likes that Erin is patient and encourages her to think through the problem and identify/correct mistakes. My student's math grade has improved and she is more confident with the material. After one session with Erin, my daughter received the highest quiz grade that she had received all year for this class (algebra). Her teacher sent a note home to say that she could see improvement. Erin is very knowledgeable and helped my daughter (who is shy) to feel comfortable in the session. Erin was very helpful. I understand the topics that I needed help with more because she explains things in a very easy to remember way. I would recommend her to anyone that needs help with General Chemistry. Working with Erin helps me understand the concepts. She gives me the confidence that I can do the the work & solve problems. She had really help me with AP Calculus. Thanks Erin!!!!!! My son had his best grade ever on a Chemistry test thanks to Erin’s incredible help and instruction. So glad we found her through this app! Highly recommend her! Thank you. She is very knowledgeable and can teach on whatever level you need! She is very understanding and has me feeling a lot better about my abilities. She was really good. Erin was very thorough on all the questions I had. She made it easier to understand. I will continue to use her for the rest of the semester. I've already booked my next session with her. Was very helpful in coming over materials for upcoming exam in organic chem. In addition was able to meet up on short noticed! would highly recommend if you need help. My son is 14 and we have been trying to explain math to him at home, but it would just end up in an argument. The teachers did not have the time to explain it to him one step at a time. He had his first lesson with Erin today and he got in the car and was excited. I have never seen my kid be excited. We will definitely stick with her to get him ready for the Staar test.